And not just trust people with our money—trust them in general? Not a whole lot of people in that group either, is there? So, why is it hard for us to trust? I’ve been thinking about this a lot lately. Who do I really trust? I trust the people I know, the people I met long before I needed anything from them or they needed anything from me. 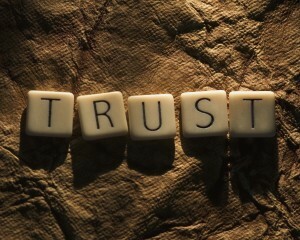 I learned to trust them when I determined they were trustworthy. So, ladies and gentlemen, today’s lesson is this: we’ve gotta get out of the house sometimes! Conferences and clubs and groups…we have to meet people. We can help them, and ultimately, they may be able to help us. Once they get to know us, they’ll love us, right? And we’ll learn to trust them. Win-win.